Formerly known as Asplenium dentatum, the Toothed Spleenwort is native to Bermuda, Florida, the Caribbean, Mexico and Central America. Leaf blades are up to 3 inches long with 6-8 pairs of pinnae. Pinnae medium green, are irregularly shaped and have slightly toothed margins. The rachis is green with no scales or hairs. The spores of this spleenwort are found in rows on the underside of the pinnae on fertile leaf blades. 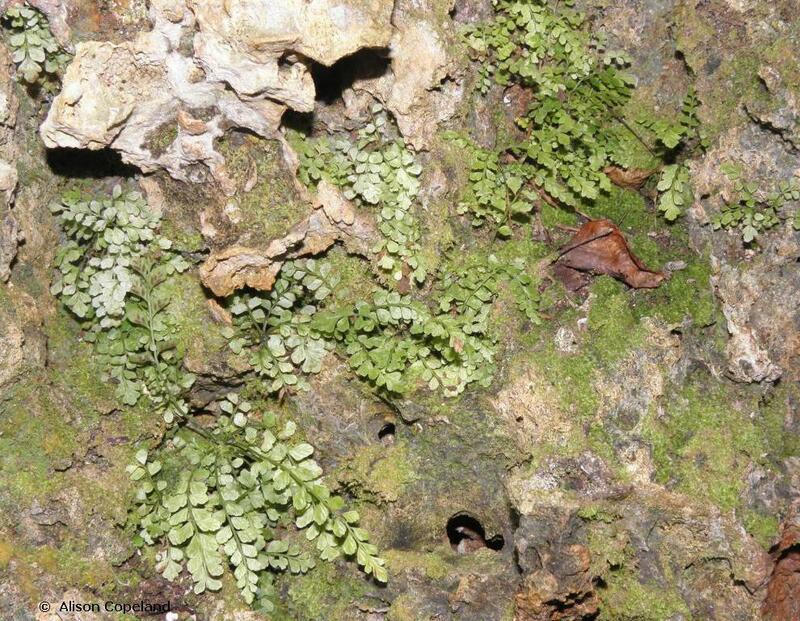 Britton records the distribution of this small fern as occurring on Abbot’s Cliff and on shaded rocks around caves in the Walsingham area, and on islands in the Great Sound. Its current distribution is unknown, but it can be found in the nature reserves at Walsingham. Due to its past population decline, Toothed Spleenwort has been listed under the Bermuda Protected Species Act 2003 (Protected Species Order 2007).